That rain a few days back is a sign that we have to bid goodbye to summer soon. Oh no, not yet. I'm still enjoying wearing pastels and comfy outfits like shorts & tees, so please do not come so soon rainy season. But let's admit, that rain was helpful eh? It cool down and subsided the heat in the metro. Whew! Since, summer is ending soon, I want to show you my few nail posts as my last hurrahs for summer. I decided to countdown on my own, so let me call this post the #3 last hurrah in my list, so expect there will be #2 & of course, #1 hurrahs. Excited? This nail polish has been with me since July 2011. Yeap, I remember the date and will never ever forget because the first time I used this polish was during the SMART Ultimate All-Star Weekend in the Araneta Coliseum featuring the PBA All-Star and of course, NBA Superstars Kobe Bryant KB24, D.Rose, CP3, J.Harden, and many more (there were 9 of them). It was our third (3rd) time to see Kobe Bryant in person and it has been always felt like heaven. This shade is a bit darker in person. The photo above is 1 shade lighter. I don't know but I noticed that even my SLR camera can't take the real color of any of the nail polishes. I used my iPhone 5 in taking these shots without using flash beside my window under natural lighting. If I used flash, it will show its truest color but I am not really fond of it, so be these photos speak itself. Oh the second to the last photo before the end of this post is the nearest, almost exactly the Summer Fling in person. You'll find out when you scroll down later. Summer Fling on my nails with 2 coats. Excuse that little hump on my middle finger nails. That part was accidentally scraped by the edge of paper, so I had to top that part (only) again with the polish. As I've said, this polish has been with me for long already. I bought this polish together with the Caronia in On The Go and I can say that formulation of this batch is very good. 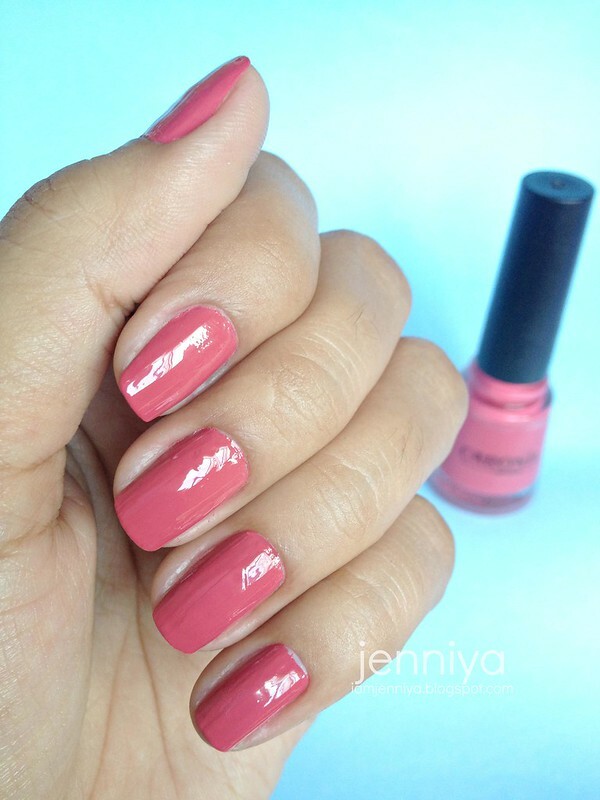 The shade is very opaque with just 1 coat. This shade still impressed me. And since this polish aged with me already, it gets dry and sticky very fast during the application. I do not have solvent with me at the moment (poor me). So, every after two nails, I have to close the cap tightly and roll the bottle onto my palms. Tip #1.) Do not shake the bottle by hitting onto your palms; it will create bubbles when the polish is applied. Tip #2.) Roll the bottle onto your palms instead. The warmth of our palms will cause heat and this will liquify again the dry/ sticky polish. Hence, application is precise and easy then. And another thing, Caronia nail brush is short and small, thus, it never flared widely especially with these old polishes; it gets so streaky, dried, create ugly humps and resulted to uneven application. Have you experienced this? I have another TIP for you below especially to those with long nails. I've learned these TIP from my Mom. She used to have a salon before during her 30's to late 40's, so she knew a lot about nail polishes. I think this will do not only for the old polishes but to any polishes, may it brand new or not. Usually, if the nail polish started to get dry and sticky, when you brush the polish from your top cuticle down, sometimes the polish can't reach the tip anymore resulted to an ugly long sharp streaks. Step #1.) 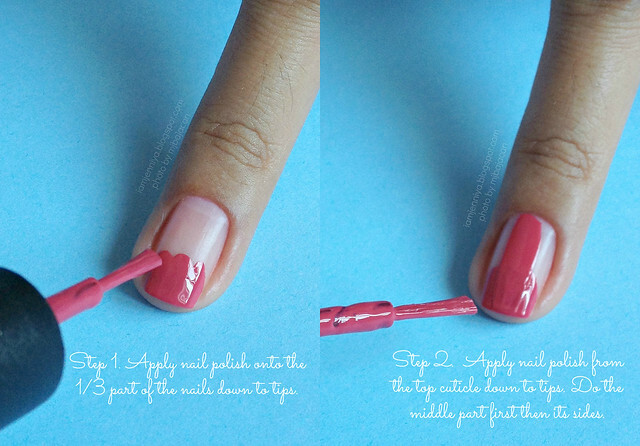 Load the brush and apply it first on the 1/3 part of your nail down to tip. Step #2.) Then, load it again with a polish and apply it from the top cuticle down to tip. Do the middle part first then both sides. This tip requires you to make 2-3 coats application. After doing the Step #1 & #2, you will see a slight hump but don't you worry. On your second coating, apply the polish as you normally do. Apply it from the top down to tips and you'll get an even result. Trust me it works! See? It's just a very little difference from the rest of the photos but this is the exact, almost the same color in person. By the way, I didn't put top coat onto my nails. The shine you see is just reflection from my window. This shade fall on cool tones but surprisingly, it still suits my warm skin tone. What do you think? This nail post reminded me of the outfit I wore when we went North 2 weeks ago. This is a perfect match to my shoes and will complement with my dress then. And because of that, I did a nail art following Complementary Scheme I pulled with that outfit. I will post that nail art soon. So, watch out for it. I hope you enjoyed reading my #3 Last Hurrah for Summer and hope those TIPS helps. I will post #2 & #1 soon. I'm excited to share it with you lovelies. 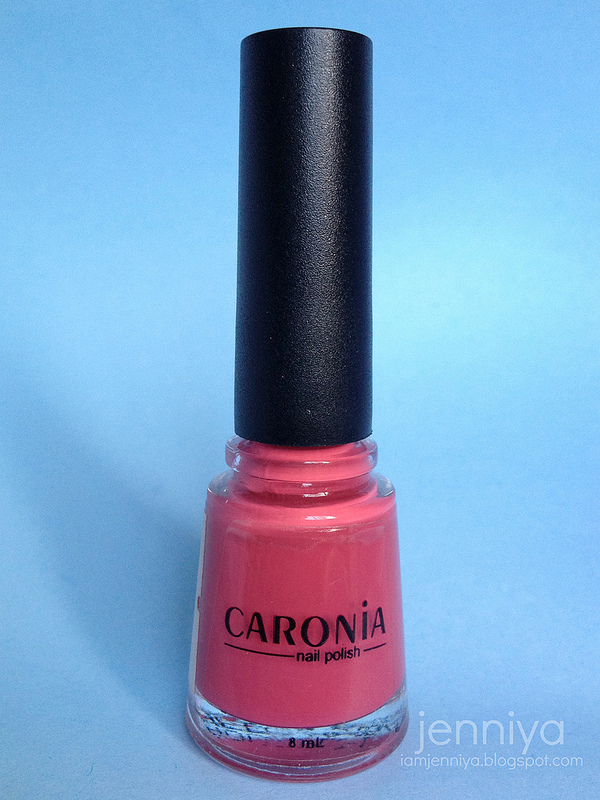 Oh don't forget to Like & Follow Caronia here, here & here. Do you have nail tips? Share it to the comment box below. P.S. I'm having an international giveaway.I hope you can join. I love this colour!!! And thanks for your tips, really helpful!!! Awww. Super love the color! Bagay sayo, and thanks for the tips. Super todo shake ako before bago ko gamitin yung mga polish ko haha then I knew this technique. 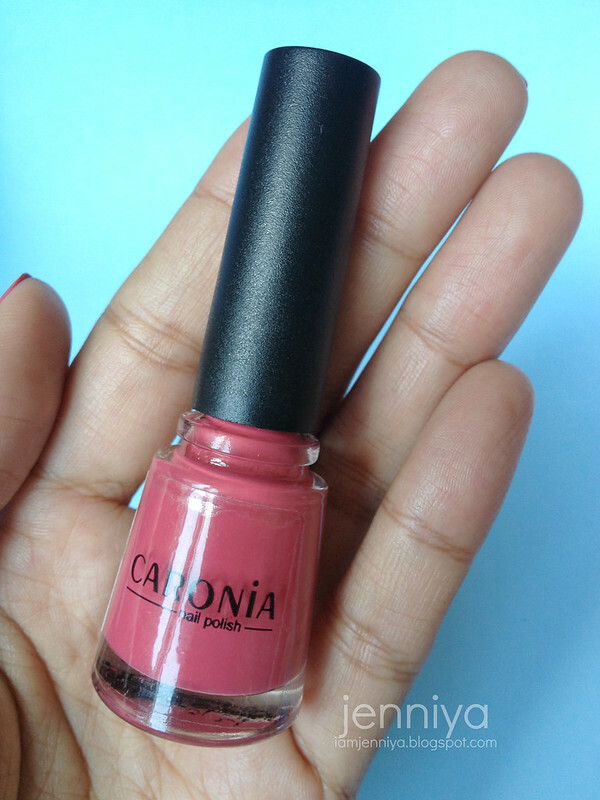 i love caronia =) very budget friendly and it can be a dupe to highend polishes! Hey there I just googled search Caronia On-The-Go and I found your blog. I was just wondering where you bought yours because I couldnt find any in all of the Watsons and Mercury Drug Stores I've been to. Thanks in advance for any info!